CivilizationEgyptian, 26th/30th Dynasty, 664 B.C.E. - 342 B.C.E. Solid cast, the bird is shown in a typical pose, wings crossed over the tail with the feathers all cleanly incised. It wears the double crown of Egypt and traces of gilding remains scattered over the surface. This probably once decorated the top of a sarcophagus. 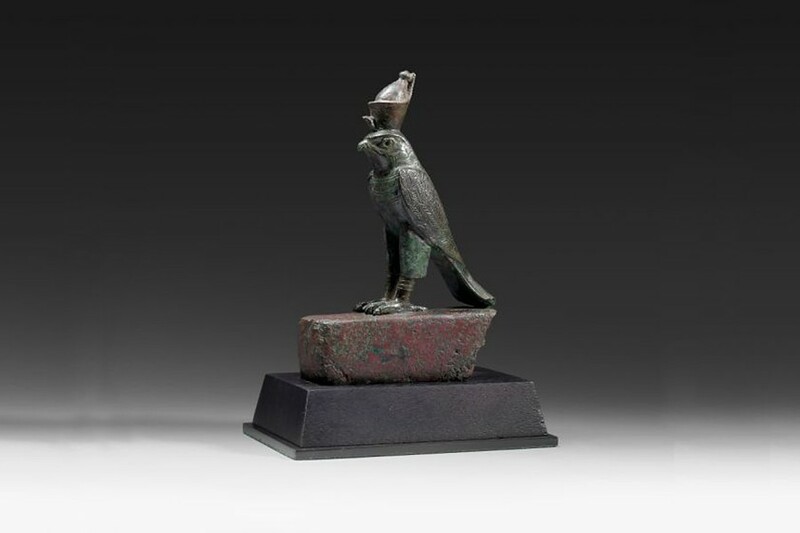 The so-called Horus falcon is one whose characteristics do not conform exactly with any of the four species known to the Egyptians: it is an idealized falcon with elements inspired by more than one of the predatory birds. The falcon was revered from earliest times for its awesome climb into the heavens and its headlong yet sure swoop upon its prey. The earliest element of the royal titulary, which officially proclaimed the ruler’s name, was the Horus name by which the holder of the royal office and the royal bird were indissolubly linked. 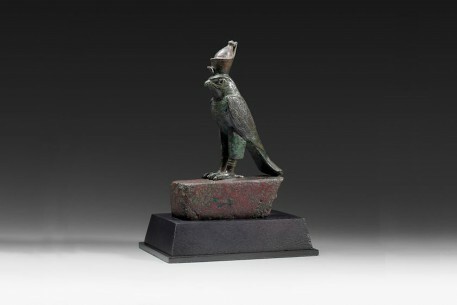 Horus was essentially protective of the king and so an image of a falcon held an inherent concept of protection. But in one creation legend, the creator god was held to be a falcon whose outspread wings formed the vault of heaven, his two eyes being the sun and moon. Thus the image of the falcon was also strongly associated with creation and regeneration. Not surprisingly it was a form adopted by a number of Egyptian gods. 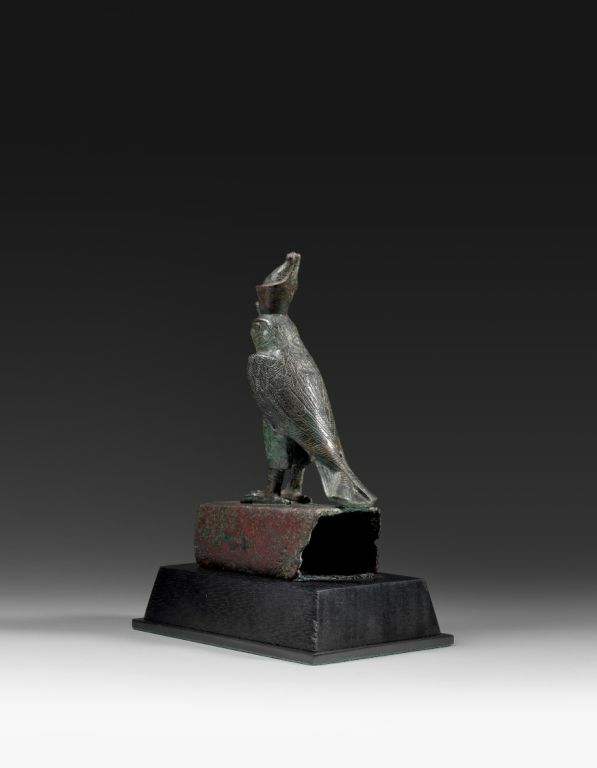 Even the name Horus refers to more than one deity since Horus of Edfu, Horus the son of Isis and Osiris and Horus the Elder are three completely separate gods with only the name in common; all could manifest themselves as a falcon. In addition, the sun god Re, Monthu the Theban war god, Sokar the Memphite funerary god, Khonsu of Thebes, even one of the Sons of Horus called Qebhsenuef could appear as falcons or falcon-headed (and there are others), with only special attributes to help distinguish each from the other and the multiplicity of Horuses. If none of these distinctive features is present and there is no inscription, identification of a falcon as being the manifestation of a specific deity is frequently impossible.